The ultimate region free DVD Player. Through this DVD player software you can play all regions DVD on all DVD drives (except the Matshita DVD-RAM serials, Sony VAIO serials and Toshiba Satellite serials) even if you have changed the region code 5 times. Record DVD movies for your Apple iPod/iPhone and PSP: DVD X Player supports recording DVD as various popular movie files to expand your multimedia entertainment on most popular portable devices (Apple iPod Video, iPhone, Sony PSP, Zune, Blackberry, Zen, Smart Phone, PMP etc.). 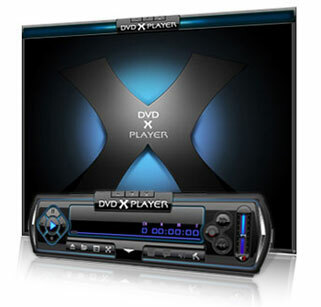 DVD X Player integrats all functions of a standard DVD player. DVD X Player can provide superior video and audio (Dolby & DTS) quality, together with other enhanced functions: e.g. record DVD, playback image and DV, image capture and bookmark, etc. Furthermore, it supports DIVX, MPEG4, RM, QuickTime, WMV, WMV-HD, MacroMedia Flash and popular media formats of Internet. DVD X Player can be extensively compatible with hardware, which is operated stable, smoothly under Windows 98\98SE\ Me \2000\ XP\Vista system. Playing DVD/VCD/CD/DivX / XviD / MPEG-4 / QuickTime / Real/ MacroMedia Flash. Region free / Code free / Zone free - RPC2/RCE Region Free/ Operation-free. Record your favorite DVD movie into video or MP3 audio files( for Apple iPod Video, iPhone, Sony PSP, Zune, Blackberry, Zen, Smart Phone, PMP etc). Support operation-free through which you can skip the FBI warning easily. Smart Stretch lets you enjoy any movie with 16:9 aspect ratio on any screen mode, without distortion. Supports Dolby Digital 5.1(AC-3), Digital Theater System (DTS), Dolby Surround, multi-channel decoding up to 7.1 channels. Visualization enables DVD X Player to display multi-colored shapes and patterns that change in harmony with the audio track being played. Desktop Video enables you to watch DVD and work simultaneously.